Spicy Cheese Cubes Arrange on skewers and grilled to lend a subtle staining and juicy flavor with spicy spices. 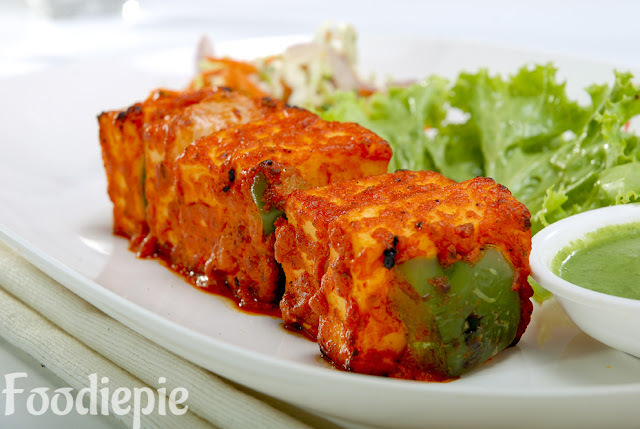 Paneer Tikka is a delicious vegetarian dish in any party. This recipe gives you restaurant-style paneer sticks for which you are craving for.You can prepare it on gas stove and on grill also.This recipe is simple to prepare at home with less other efforts.Let's checkout Recipe. Step 1 : Cut the Paneer in 15-16 cubes and add in the bowl. Step 2 : Add ginger-garlic paste, salt, cashmere red chilli powder, red chili powder, turmeric powder, curd, carom seeds, kasoori fenugreek and coriander powder with cumin powder, garam masala, black salt and amchoor powder. Step 3 : Mix all them then add onion. cubes cut capsicum and A Lemon juice in it. Step 4 : Add Cottage Cubes and mix with bare hands for cottage cheese to absorb all the spices . Step 5 : Add mustard oil on it and mix all well together. Step 6 : Soak the wooden skewer in water for 10 minutes and wipe it before using. Step 7 : Place marinated paneer cubes in skewer one by one and grease them with oil.Now paneer skewered tikka is needs to be cooked.You can cook it in two ways based pn what king of equipment you have. Heat a non sticky pan or non sticky tawa and add oil. Then Place skewered cheese over it and shallow fry them over medium flame .Turn sides of the skewer 3-4 times until all sides are cooked properly.Transfer them to plate and serve it. For Grill : Before grilling keep Skewers in refrigerator for around 30 minutes. After refrigeration Grill the skewers for 20 minutes at 200 Degree Celsius.Serve hot garnished with chat masala and also with coriander or mint chutney.